The National Cocktail Championship & Bartender Awards 2019 are open to all bartenders working in the Republic of Ireland. The championships will take place on Tue 26th, Wed 27th & Thurs 28th February 2019 as part of CATEX, RDS, Dublin. All entrants are eligible for the following awards whether they are BAI members or not. The awards will be announced from the stage at the competition venue directly after Round 1 on Tuesday 26th February. Award for the highest scoring bartender from a hotel. Award for the highest scoring bartender from a Pub/Gastro Pub. Award for the highest scoring bartender from a restaurant. Award for the highest scoring first time competitor at the NCC between 18-25 years of age, excluding the overall winner. Award for the highest scoring first time competitor at the NCC age 26 and above, excluding the overall winner. Best Technical Bartender - Awarded to the bartender with the highest technical score. DNA Award - Awarded to the Bartender with the best Drink Name Association for their cocktail. Art Deco Award - Awarded to the Bartender with the best cocktail decoration. The Bartender with the highest combined cocktail and technical points from the SUPER FINAL will be deemed the National Cocktail Champion and will represent Ireland at the WORLD COCKTAIL CHAMPIONSHIPS 2019, in Chengdu, China, 4th-8th November 2019. Term & conditions apply. In accordance with the rules set by the International Bartenders Association (IBA) only a member of the Bartenders Association of Ireland (BAI) may represent Ireland at the World Cocktail Championship. All entrants are encouraged to join the Bartenders Association of Ireland. 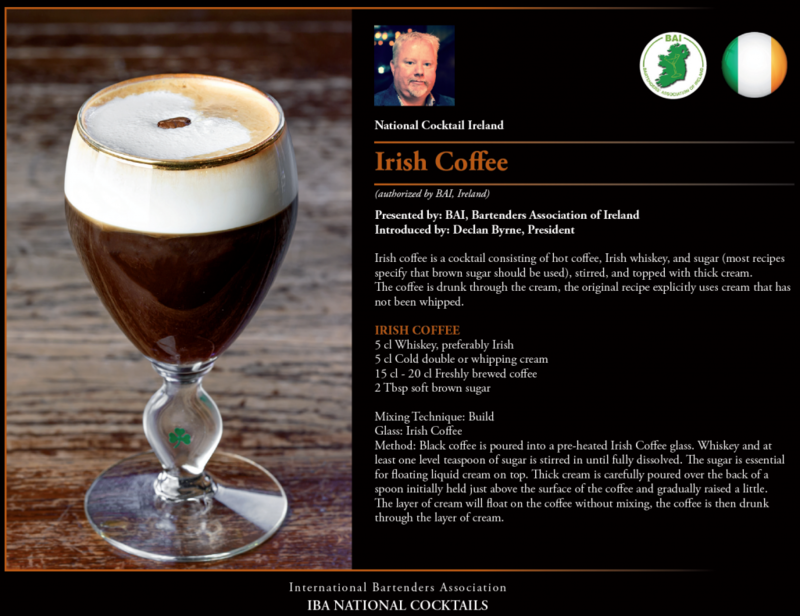 The BAI is Ireland’s only representative body for bartenders affiliated to the International Bartenders Association (IBA). Updates to these rules, if any, will be posted below. Entries will only be accepted via our online entry form on bartender.ie. Competitors shall submit one original recipe. Competitors shall be required to make five (5) portions of their submitted recipe. Each recipe shall contain a minimum of 1.5cl of a base spirit provided by Edward Dillon & Co. Ltd. Entry is limited so will close as soon as the limit has been reached or on Tuesday 12th February 2019 @ 12pm (noon), whichever comes first. Early entry is advised. Recipes shall contain no more than 7cls of alcoholic product(s) in total. Technical judges will closely observe this rule. The use of a measure is recommended for accurate pouring. Free pouring is not recommended. Recipes shall be expressed in centilitres, divided in respectively whole numbers (1cl, 2cl, 3cl, etc.) and/or half numbers (0.5cl, 1.5cl, 2.5cl, etc. ), dashes and/or drops being the smallest quantities. Recipes should contain: At least two (2) but not more than four (4) alcoholic ingredients, the base spirit (i.e. brandy, gin, rum, vodka, whiskey, tequila, etc.) must be from the Edward Dillon & Co. Ltd. portfolio. The other ingredients, must therefore be utilized as flavouring modifier (i.e. bitters, liqueurs, cocktail syrups, etc.) and stretchers (i.e. juices, sodas, etc.). A maximum of six (6) ingredients including dashes and drops is permitted. Homemade ingredients and/or infusions are NOT permitted. Competitors may choose from the following methods to prepare their cocktails: build, stir, shake, blend, throw, muddle or a combination of the above. Competitors are required to bring their own bar utensils & equipment to prepare the cocktails. This includes ice crushers, shakers, tongs, strainers, etc. and should not be branded with competing brand logo's. Competitors are required to bring their own glassware. Fresh cream and eggs are permitted. Heated ingredients are not permitted. Any substitutions or questionable ingredients must have the approval of the BAI President prior to competition commencement. Don’t leave it to the morning of the competition to get this approval. We expect you to be well rehearsed for the competition. The cocktail you submitted on the entry form must be the cocktail you make on stage. Competitors should be aware of recommended retail price of their cocktail as it would appear in their cocktail menu. If you’re not sure ask your manager. Competitors must be aware of the units of alcohol contained in one portion of their cocktail. All sponsoring brands and products will be provided for competitors use. Any other ingredients must be provided by the bartender and poured from a non branded bottle or clear glass jug. Brands & products that compete with the our sponsors brands are not permitted for use in the competition. All garnishes must be prepared in the garnish preparation area only which may be in front of an audience/judges. Any kind of pre-fixed garnishes (partly prepared elsewhere) will be taken out of the competition and the contestant involved may be penalised. The time allowed for the preparation of the garnishes is fifteen (15) minutes. After this time, penalties shall be given. Food dyes shall not be allowed in the drink. Products (such as cocktail sticks, etc.) may be used to fix the garnish to the glass. Condiments such as: salt, sugar, pepper, nutmeg, cinnamon, chocolate decoration like sprinkles, sprays and citrus zest which are commonly used, shall be allowed and will not count as an ingredient if submitted as a garnish. All entrants must be able to speak English. Prizes are not transferable. There is no cash alternative. Participation confirms acceptance of these rules. Judges' decision is final and no correspondence will be entered into. The winner will be expected to participate in follow-up promotional activity and training for the World Cocktail Championships after the competition. This may include but not restricted to being photographed and interviewed. The BAI reserve the right to limit the entry to ensure a smooth running competition for all concerned. All recipes entered become the property of the Bartenders Association of Ireland. The bartender will be credited when and where possible. Submit your entry using the online form as soon as possible but definitely before noon on Tuesday 12th February 2019. The sequence of competitors shall be announced at the competitors briefing 10.30am on each day of competition. Competitors are requested to dress with style or in a high class professional bartender’s uniform (without branding of any competing brands). NO BAI GREEN BLAZER to be worn by any competitor!!! These blazers are for active or ceremonial duties and not for competing. Competitors must not carry any brands from drink manufacturers other than brands from our sponsors on clothing or bar equipment. Each competitor shall be limited to seven (7) minutes for making their cocktails. Competitors that exceed the time limit will be severly penalised. At 8 mins, competitors must step back from their work station. The highest scoring six (6) bartenders with cocktail points and technical points combined from Round 1 will qualify to compete in the super final. Scores obtained in the first round by a competitor will NOT be added to the scores in the super final. All finalists therefore will enter the super final round on a blank score-sheet. Prepare two portions of a standard classic cocktail chosen randomly from a shortlist provided by the BAI. Prepare 5 portions of their signature cocktail as prepared in round 1, without amendment to recipe or garnish. Describe to the judges and audience (wearing a head mic) what they are doing and why. Finalists will be judged on their cocktail, technical performance, personality and knowledge. 10 minutes to prepare and serve five portions of their signature cocktail. All participants and finalists will receive a certificate detailing their participation in the National Cocktail Championship 2019 which will be presented after Round 1. The BAI reserve the right to amend, alter or change the format and rules without notice to facilitate our sponsors or the show organisers.